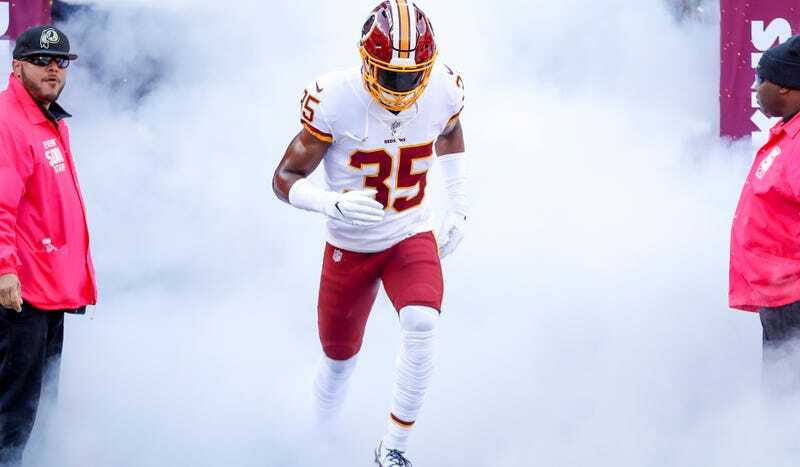 Washington safety Montae Nicholson was arrested early Tuesday morning outside of World Of Beer in Ashburn, Va. and charged with assault and battery and being drunk in public. His girlfriend Sydney Maggiore was charged with malicious wounding and assault and battery, and both were taken to the Loudoun County Adult Detention Center. According to a Loudoun County police report, Nicholson and Maggiore were accused of attacking and beating up a couple after pulling up on them in a car. TMZ obtained and published footage of the fight today, which purportedly shows Nicholson shrugging off someone trying to restrain him before knocking out a man wearing a denim jacket. The man who Nicholson hits with the left cross appears to go limp and fall to the ground. The couple who Nicholson and Maggiore allegedly attacked were apparently treated for non-life threatening, but serious injuries at a local hospital. Nicholson started the first seven games of the year for Washington before the team traded for HaHa Clinton-Dix. Washington is reportedly weighing a suspension for Nicholson. Update (5:12 p.m. ET): Washington is putting Nicholson on the reserve/non-football injury list, which means he’s done for the season.